Quarles’ Mills, Va., May 26, 1864. 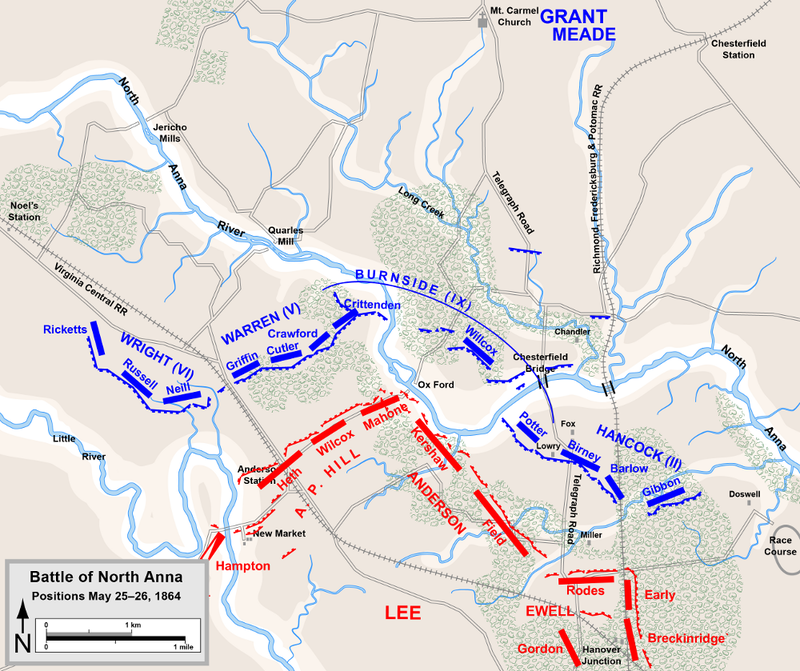 GENERAL: The relative position of the two armies is now as follows: Lee’s right rests on a swamp east of the Richmond and Fredericksburg road and south of North Anna, his center on the river at Ox Ford, and his left on Little River, with the crossing of Little River guarded as far up as we have gone. Hancock, with his corps and one division of the Ninth Corps, crossed at Chesterfield Ford, and covers the right wing of Lee’s army. One division of the Ninth Corps is on the north bank of the Anna at Ox ford, with bridges above and below at points nearest to it, where both banks are held by us, so that it could re-enforce either went of our army with equal facility. The Fifth and Sixth Corps, with one division of the Ninth Corps, run from the south bank of the Anna from a short distance above Ox Ford to Little River and parallel with and near to the enemy. To make a direct attack from either wing would cause a slaughter of our men that even success would not justify. To turn the enemy by his right, between the two Annas, is impossible on account of the swamp upon which his right rests. To turn him by his left leaves Little River, New Found River, and South Anna River, all of them streams presenting considerable obstacles to the movement of an army, to be crossed. I have determined, therefore, to turn the enemy’s right by crossing at or near Hanovertown. This crosses all these streams at once, and leaves us still where we can draw supplies. During the night last night the teams and artillery, not in position, belonging to the right wing of our army, and one division of that wing were quietly withdrawn to the north bank of the river and moved down to the rear of the left. As soon as it is dark this division, with most of the cavalry, will commence a forced march for Hanovertown to seize and hold the crossing. the balance of the right wing will withdraw at the same hour and follow as rapidly as possible. The left wing will also withdraw from the south bank of the river to-night and follow in rear of the right wing. Lee’s army is really whipped. The prisoners we now take show it, and the action of his army shows it unmistakably. A battle with them outside of entrenchments cannot be had. Our men feel that they have gained the morale over the enemy and attack with confidence. I may be mistaken, but I feel that our success over Lee’s army is already insured. The promptness and rapidity with which you have forwarded re-enforcements have contributed largely to the feeling of confidence inspired in our men and to break down that of the enemy. We are destroying all the rails we can on the Central and Fredericksburg roads. I want to leave a gap in the roads north of Richmond so big that to get a single track they will have to import rails from elsewhere.